Sometimes a nicely styled image draws you to a product – never underestimate the importance of well-styled product shots! – and so these photos from Magpie caught our eye. This is where we need to raise our hand and say how much we like this company’s ethos. Magpie is a British homewares company with a love of nature that extends to their methods of manufacture. What does this mean in term of the ceramic pieces you see here? Magpie’s ceramics are made from porcelain, which uses a mixture of three clays – kaolin, quartz, and feldspar. They don’t use bone china, which is made using bone ash derived from animal bone. So whether you’re vegan or simply want to make cruelty-free choices when selecting homewares, this is something to bear in mind when considering tableware. Which brings us back to this new range of Viva tableware designed for Magpie by Sarah Campbell. Sarah has been painting patterns for over five decades, having co-founded the influential design company Collier Campbell with her sister Susan Collier in 1979. Now working under her own name, Sarah Campbell Designs, Sarah undertakes a wide range of projects from unique pieces and commissions to textile designs for the high street. Original in concept and colour, the VIVA collection reflects Sarah’s love of juxtaposing patterns and motifs – in this case showcasing a geometric pattern of diamonds and triangles with more than a hint of a midcentury vibe. These vibrant hand-painted designs are featured on a range of products from porcelain cups & saucers, jugs & bowls , along with tea towels, trays, coasters and placemats. Showcasing this collection on String shelving (above) was a nice touch – designed by Nils Strinning in 1949, this shelving system went on to become a twentieth century design icon. 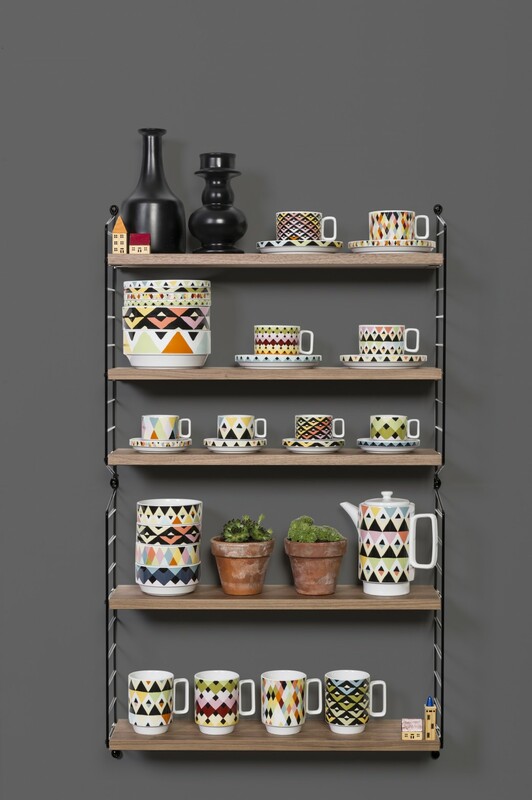 For us, the highlights of the VIVA collection are the mugs, which come in four different patterns, and the teapot in Diamond Stripes (above and below) which feels like a cool sixties find thanks to its height and the handle shape that runs through this collection. Prices range start from £12 to £30 – check them out on the JamPot website.